And it’s February again!! Yup!That time of the year when the love bug bites and singing cupids hit us on every side with classic love anthems. Dropping a track for this Love Train, multi-award winning singer, Nikki Laoye, fresh from her Headies win for her hit song “Only You”, teams up with her brother, ace music producer/recording artiste, Xblaze & fast rising singer, Runel Karebian, in this love laced dance hit, “Your Number”. 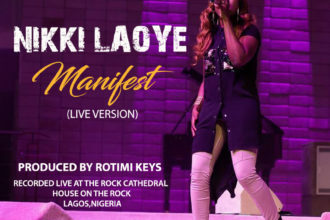 Renowned for their unique musical creativity, The Laoye Duo make a definite statement with this catchy tune as Xblaze & Nikki keep you entranced with their arty vocals, smooth lyrical play & mind-blowing harmonies, while Runel Karebian turns the heat up with his chant of life. With its superb fusion of South African House Beats, Indian drums & Classic HipHop DJ Scratches, “Your Number” is bound to be a massive all-round favourite in no time. It’s just a #LoveThang on the DanceFloor… Another stellar production by the very talented Xblaze, who is also the brain behind Nikki’s hit songs “1-2-3”, “Taka Sufe” & “No Be Beans” and ModeNine’s “Muzik Lives”. You’ll surely keep this song on a loop… Nikki & Xblaze really got our number on this one!